Love Doughnuts and Love Chocolate? 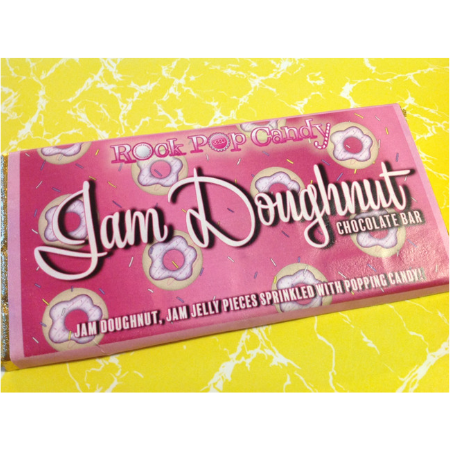 The Rock Pop Candy Jam Doughnut Bar is heaven in a chocolate bar! White and milk chocolate, with raspberry jelly, brownie pieces, sprinkles and popping candy! And yes, it really does taste as good as it sounds! This bar is exclusive to Rock Pop Candy. Have a look at some of the other great bars we have in stock like the Cheese and Crackers bar, or the Crushed Coffee bar from Love Cocoa. This bar was made just for us, by those fabulous people at The Chocolate Smiths! And it is suitable for vegetarians too!